Givenchy does not have a huge anchor in the territory of men’s fragrances despite past successes of Gentleman, Vetiver and Pi. The brand has therefore decided in 2008 to strike a blow with a scent in the air time, masculinity techno-chic, Play, whose ambassador is Justin Timberlake. The launch was a success but nothing really last today in the world of perfumery and the consumer often changes. This requires the continuously creation of desire . Play, after being kept under the spotlight in 2010 with the launch of Play for Her, will offer in 2012 an escape to the sport territory. Concentration of energy in the extreme freshness, Play Sport will be the booster of adrenaline for a modern man. 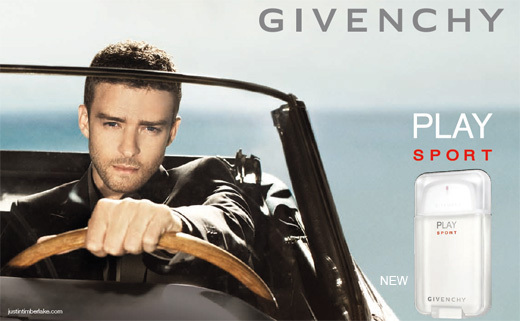 A fragrance built around the wood of Amyris typical signature of Play, starring Justin Timberlake driving a vintage convertible car. Available in March 2012 in 50ml and 100ml eau de toilette.